Not all heroes wear capes, in fact some use lipstick & pearls as their secret weapons. My grandmother (AKA Memaw) is my everyday hero! For much of my childhood, my Memaw & Pops lived next door, in a house my father built for them. The love my grandparents showed me helped shape me into the woman I am today, but it was the stories my Memaw shared about her own childhood & experiences as a young woman in the 1940s that I could never get enough of. 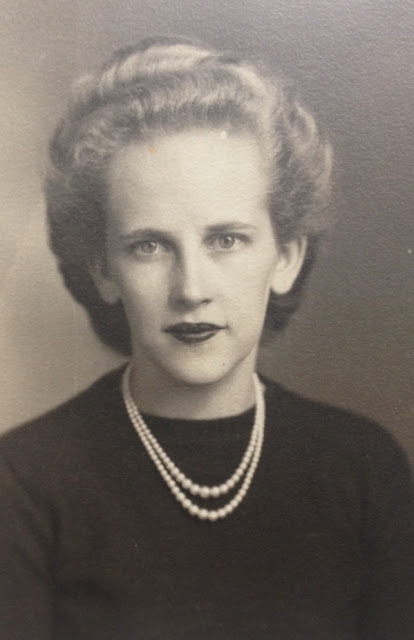 My grandmother was a strong-willed, sassy, tells it like it is woman, with a fierce gaze & the best belly laugh! I think many would say that she passed these traits down to me & I couldn't be happier to carry this piece of her. My grandmother was a teacher for 35 years, & after she passed away last Fall, it was with great joy that I sorted through stacks of class portraits, her (now 50 year old) grade books, correspondence from former students throughout the years, & newspaper clippings she had saved from her many pupils. She was passionate about her students, getting involved in their lives, & for many of them, forever remaining their favorite teacher. As I am now following in her footsteps as a teacher, I often find myself channeling how I imagine Memaw must have been in her classroom - gathering peace in stressful situations, looking at my students as whole humans rather than the mistakes they have made in the moment. One of the last letters Memaw sent me (she was a master letter writer!) included the line "may you be happy all the days of your life" & I plan on finding the joy in every moment to continue the legacy of my Memaw. That is why she is my hero. I love this photo of my Memaw - her signature hair style, dazzling eyes - perfectly capturing her fierce spirit. In 1999, celebrated photographer Annie Leibovitz published her first book Women, a collection of portraits, highlighting her ability to capture the essence of each person with a single snap. Now, Annie Leibovitz is taking a new show on the road - using pictures to explore the changes in the roles of women today. In partnership with UBS, Annie Leibovitz launched a global exhibition for Women: New Portraits! It kicked-off in London in January 2016, & will be in ten cities over the next year. The exhibition is free (& currently in San Francisco), but 2 lucky ducks are going to win a trip for to NYC to visit the exhibition in November 2016. A winner will be selected at random each month. To enter, Instagram your everyday female hero & her stories using #ShareYourHero + tagging @UBS (see the other entries here under #ShareYourHero). Let’s celebrate the everyday heroes in our lives that are capable of extraordinary things – your mother, your sister, your friend, your girlfriend, your teacher, your doctor, your grandmother, your mentor, etc. Who’s your everyday hero? If you instagram her, link your Instagram profile below – I’d love to see it! Visit www.ubs.com/annieleibovitz to learn more.